Looking to rebound off a subpar eighth-place finish in the Grade 1 Breeders' Cup Filly and Mare Sprint on November 3, Chester and Mary Broman, Sr.'s Highway Star will return just eight days later to lead a field of 11 in the $125,000 New York Stallion Series Staten Island Division for fillies and mares 3-years-old and up at seven furlongs on Sunday at Aqueduct Racetrack. Highway Star, a 5-year-old multiple graded stakes winning New York-bred daughter of Girolamo trained by Rodrigo Ubillo, has one win from seven starts this year. 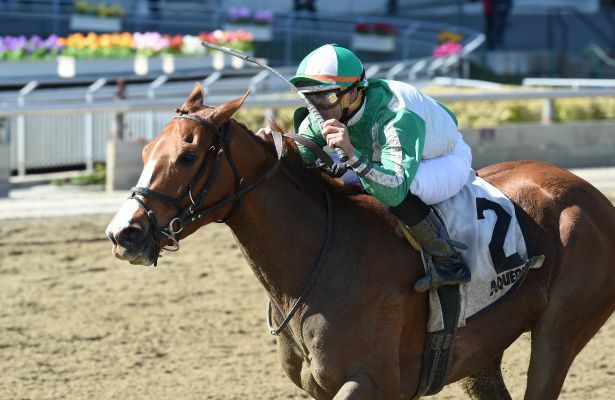 Beginning her 2018 campaign with a fifth-place finish in the Heavenly Prize Invitational on March 10 at Aqueduct, she returned to run a game second in the Grade 2 Ruffian on May 6 at Belmont Park. Finishing second by a nose in the Critical Eye at Belmont later that month, she went on to earn second in the Grade 3 Bed o' Roses June 8. Kicking off her fall campaign with a sixth-place finish in the Grade 2 Gallant Bloom, she won the Iroquois on October 20 at Belmont before entering the Breeders' Cup Filly & Mare Sprint. With three wins from five starts and one second-place finish at the Big A, Ubillo is looking forward to running his prized runner back in New York. "I don't usually run horses back this quickly, but she's shown that she's come back well from Churchill," said Ubillo. "We know that she likes to run in New York and this is certainly an easier spot for her, so we're looking to take advantage of that here. We know the distance is ideal for her, so hopefully she can perform to the best of her ability." Highway Star will leave from post 8 with Irad Ortiz, Jr. aboard. Trainer Rudy Rodriguez will enter a pair of Frost Giant mares in Frostie Anne, who he owns alongside Michael Imperio, and Frosty Margarita, a homebred for Gabrielle Farm. Claimed for $25,000 in December of last year at Aqueduct, Frostie Anne has since gone on to win six races from nine starts, including victories in the Sis City on March 31 at Aqueduct and the Saratoga Dew on August 17. Frosty Margarita is in search of her first victory since capturing the Jack Betta Be Rite on August 13 at Finger Lakes. In her subsequent two starts, she ran fourth in the Saratoga Dew and Arctic Queen on October 1 at Finger Lakes. "I breezed both of them today and they each seem to deserve a chance to take a shot here," said Rodriguez. "It'll be a bit of a cutback for Frostie Anne, but before I claimed her, she was mostly running at sprint distances, so I think this will fit her. Frosty Margarita is doing good in her own right and she's training well enough to rebound and run a good race here." Frostie Anne will depart from post 10 with Junior Alvarado aboard. Frosty Margarita will leave from post 11 with Jose Lezcano in the irons. Testing stakes competition for the first time will be Starlite Mission for trainer Gary Contessa and owners John Moirano, Monty Foss, Pines Stables, and Bob Chimienti. Sired by Mission Impazible, the 3-year-old filly broke her maiden in her ninth career start on July 12 at Belmont and has since finished second by a half-length in her two most recent starts in allowance races against fellow New York-breds on September 21 and October 20 at Belmont. With Luis Saez aboard, Starlite Mission will leave from post 5. Rounding out the field is Andesine for trainer Chris Englehart and Island Wind Racing; Aunt Babe for trainer James Ferraro and owner Louis Ferrari; Bluegrass Flag for trainer Tom Morley and owner Thomas Albrecht; Frost Wise for trainer Michael Dilger and owner George Autry; She's Delightful for Our Sugar Bear Stable and trainer Bruce Brown; Fair Regis for Drawing Away Stable and trainer Robert Falcone, Jr. and Our Super Nova for owner and trainer Lauren Linn. With the recent announcement that purse levels for New York Stallion Series races will be doubled from $1,150,000 to $2,300,000 starting in 2019 with support from the New York Thoroughbred Breeders and the New York State Breeding and Development Fund, Rodriguez, a regular on the NYRA circuit, echoed his support. "That's great for everybody," said Rodriguez. "It's good for the owners, so they can claim and put some more money in the game as well as the horsemen with bigger outfits. Hopefully, the initiative will get support leading to strong fields for bettors as well."